Ecosummit accelerates smart green startups, investors and corporates. Our vision is to automate sustainability in energy, mobility, industry and cities. Our conferences are startup markets enabling business development, co-investing, open innovation, corporate venturing and M&A. Since 2010, we organised 19 events in 5 countries. Ecosummit TV on YouTube provides over 1.000 videos (450.000 views). 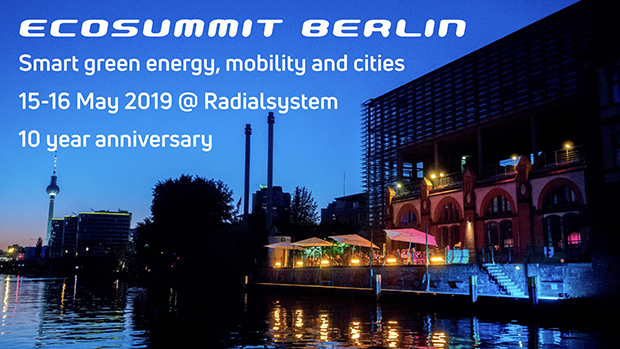 You are welcome to sponsor and join our 10 year anniversary Ecosummit Berlin 15-16 May 2019. The Ecosummit sponsor pitch (PDF) provides the details of the available sponsorship packages. Sponsor benefits include deal flow generation, portfolio showcase, co-investor networking and event marketing. 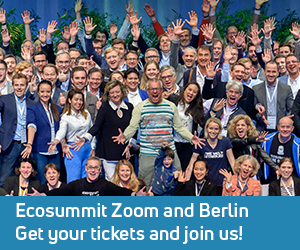 All sponsors are invited to the exclusive Ecosummit sponsor dinner on the evening before the conference, Tuesday, 14 May 2019, 19:00. Please contact us to discuss the sponsorship opportunities. We also encourage you to learn more about Ecosummit Ventures. Smart green accelerator: The Swedish Energy Agency works for a smarter energy use, which involves among other things to channel practically all Swedish state funds that go into energy research. The Business Development and Commercialisation department is focused on making business from this research by bringing together researchers and business developers, contractors, customers and capital. This department also provides their own funding to cases with technical uniqueness, high energy relevance as well as a strong team behind the concept. Smart green corporate VC: Schneider Electric is leading the Digital Transformation of Energy Management and Automation in Homes, Buildings, Data Centers, Infrastructure and Industries. With global presence in over 100 countries, Schneider is the undisputable leader in Power Management – Medium Voltage, Low Voltage and Secure Power, and in Automation Systems. We provide integrated efficiency solutions, combining energy, automation and software. In our global Ecosystem, we collaborate with the largest Partner, Integrator and Developer Community on our Open Platform to deliver real-time control and operational efficiency. We believe that great people and partners make Schneider a great company and that our commitment to Innovation, Diversity and Sustainability ensures that Life Is On everywhere, for everyone and at every moment. Smart green corporate VC: Sustainable energy for everyone. That is what drives Eneco’s endeavours. We are a leading Dutch utility, focused on sustainable, smart energy solutions. We provide for the daily energy needs of over 2.2 million private and business customers through trading, supply and generation, but increasingly by offering smart, decentralized solutions in area’s such as smart home, solar & storage, smart charging etc. Instead of defending old business models, we aim to lead the transition towards more decentralized, sustainable and cooperative energy systems. Eneco Innovation & Ventures is our business unit dedicated to developing new products and services together with business partners and startups. We collaborate with, and invest in, innovative businesses in order to jointly innovate and create commercial success for new smart energy services. We seek technologies and business models that can accelerate our development of sustainable, decentralized, smart energy services. In turn, we can offer scaling opportunities, knowledge and access to markets as well as capital investments as part of our venturing portfolio. Smart green corporate VC: Centrica Innovations has been established to invest in new technology and ideas that will transform the way we live, work and move. We’re collaborating with change-makers around the globe, searching for new innovations for homes and businesses, and accelerating ideas from across the Centrica Group. We’re on a mission to invest £100m in new technologies and innovations. We have scouts in key technology hubs around the world who are on the lookout for the most promising new businesses, entrepreneurs and innovators that can join us in shaping all our futures. We’re particularly interested in distributed energy, electrification of transport, and increasing convenience and connectivity through data, blockchain and the Internet of Things. Smart green corporate VC: INVEN CAPITAL is a €180M corporate VC fund established by the major European energy utility CEZ to invest in the new energy sector. INVEN CAPITAL seeks investments into small to middle-market innovative cleantech companies from Europe. We target late-stage startups with a business model proven by sales and significant growth potential. We focus on creating long-term value through an active partnership with the management of our portfolio companies. In our approach we actively support strategies for organic and/or acquisition growth. We can provide unique benefits to our portfolio companies and co-investors through (a) in-depth energy sector expertise, (b) utilization of CEZ Group’s client base and (c) technological synergies related to the asset base of our investor. Our investment team represents a balanced mix of skills from the energy sector, structured finance and investment banking. INVEN CAPITAL was founded in 2014 and is based in Prague. Smart green corporate VC: BayWa r.e. Energy Ventures is a Munich based venture capital firm looking for early stage investment opportunities in the energy market all over Europe and Israel. We focus on scalable business models in the areas of digital energy solutions, storage and e-mobility. BayWa r.e., which began life itself as an innovative new renewable energy business, initially invests up to five million euros per startup and assist with industry expertise, infrastructure and distribution. BayWa r.e. Energy Ventures acts as a standalone business and can guarantee startups maximum independence, quick decisions and flexibility. Focusing on startups in Europe and Israel, the team is led by Ulrich Seitz, a venture capital manager with over ten years of experience on the startup scene. As a wholly-owned subsidiary of BayWa AG, BayWa r.e. renewable energy GmbH combines the activities of the solar energy, wind energy, bioenergy, geothermal energy and energy trading business sectors. Based in Munich, BayWa r.e. is a globally active company. As a full service partner with over 1,700 employees and more than 25 years of market experience, BayWa r.e. develops, implements, consults and supports projects in the renewable energy sector. Smart green VC: InnoEnergy is the European company dedicated to promoting innovation, entrepreneurship and education in the sustainable energy field by bringing together academics, businesses and research institutes. To support entrepreneurs and startups in sustainable energy we are an active pre-seed/seed investor. Our goal is to make a positive impact on sustainable energy in Europe. We do this by creating future game changers with a different mind-set, and bringing innovative products, services and successful companies to life. We provide acceleration services to startups by supporting entrepreneurs with their business ideas, strengthening their business models, building expert teams, and providing access to finance. We already have a share in more than 50 ventures. InnoEnergy is one of the first Knowledge and Innovation Communities (KICs) fostered by the European Institute of Innovation and Technology (EIT). We are a commercial company with 27 shareholders that include top ranking industries, research centres and universities, all of which are key players in the energy field. More than 150 additional partners contribute to our activities to form a first class and dynamic network that is always open to new entrants and furthers our pursuit of excellence. Although we are profit-oriented, we have a “not for dividend” financial strategy, reinvesting any profits we generate back into our activities. With our headquarters in the Netherlands, we develop our activities across a network of offices located in Belgium, France, Germany, the Netherlands, Spain, Portugal, Poland and Sweden. Smart green corporate VC: BP Ventures was set up more than ten years ago to identify and invest in private, high growth, game-changing technology companies, accelerating innovation across the entire energy spectrum. Since then, we have invested over $500 million in technology companies across more than 40 entities with more than 200 co-investors. Venturing plays a key role in BP’s strategy to tackle the dual challenge of meeting the world’s need for more energy, while at the same time reducing carbon emissions. We will do this by leveraging our investments across a portfolio of relevant technology businesses that will help BP transition to a low carbon company. Smart green corporate VC: ABB is a pioneering technology leader in power grids, electrification products, industrial automation and robotics and motion, serving customers in utilities, industry and transport & infrastructure globally. Continuing a history of innovation spanning more than 130 years, ABB today is writing the future of industrial digitalization with two clear value propositions: bringing electricity from any power plant to any plug and automating industries from natural resources to finished products. As title partner in ABB Formula E, the fully electric international FIA motorsport class, ABB is pushing the boundaries of e-mobility to contribute to a sustainable future. ABB operates in more than 100 countries with about 147.000 employees. ABB Technology Ventures (ATV) is the venture capital unit of ABB. ATV partners with breakthrough industrial technology companies aligned with ABB’s goal to write the future of industrial digitalization and has invested nearly $200 million into startups spanning a range of sectors including robotics, drones, industrial IoT, AI/machine learning, 3D printing, cybersecurity and distributed energy. Smart green corporate VC: Under its Cleaner & Better Energy strategy, E.ON’s drive to retail distributed and novel energy technologies and business models will be supported by venture capital activities for strategic partnerships. They are designed to find the next big energy propositions that will improve E.ON’s offer to its millions of customers around Europe via its global and regional businesses. The best new businesses will be selected for collaboration and commercialization opportunities and equity investments. The investments will focus on strategic technologies and business models that enable E.ON’s desire to lead the move to distributed, renewable and disruptive energy propositions. Customers can be offered the best energy choices for their needs. And new technology companies benefit from early scale while E.ON accesses cutting edge innovations and participates in the value created. Smart green corporate VC: innogy Ventures is the €130M venture capital arm of the innogy Innovation Hub. We focus on data-driven companies which contribute to the Internet of Things or digital transformation, primarily in Europe, Israel and North America. We run a quick and transparent process and take a collaborative, portfolio-first approach. Each venture is supported with a hands-on attitude, deep market understanding and business development assistance. We offer our portfolio companies access to relevant people and units within the innogy group to help them become more competitive and accelerate their growth. Smart green corporate VC: Total is the world’s fourth-largest oil and gas company, as well as a major integrated player in low-carbon energies. Backed by nearly a century of history we discover, produce, transform, market and distribute energy in a variety of forms, to serve the end customer. We are committed to energy that is affordable, reliable and clean, in compliance with the highest safety and environmental standards. Smart green corporate VC: ENGIE develops its businesses (power, natural gas, energy services) around a model based on responsible growth to take on the major challenges of energy’s transition to a low-carbon economy: access to sustainable energy, climate-change mitigation and adaptation and the rational use of resources. The Group provides individuals, cities and businesses with highly efficient and innovative solutions largely based on its expertise in four key sectors: renewable energy, energy efficiency, liquefied natural gas and digital technology. ENGIE employs 153,090 people worldwide and achieved revenues of €66.6 billion in 2016. The Group is listed on the Paris and Brussels stock exchanges (ENGI) and is represented in the main international indices: CAC 40, BEL 20, DJ Euro Stoxx 50, Euronext 100, FTSE Eurotop 100, MSCI Europe, DJSI World, DJSI Europe and Euronext Vigeo (Eurozone 120, Europe 120 and France 20). ENGIE also allocated an investment fund of €115 million dedicated to innovative startups and an investment fund of €50 million committed to energy access. Enel is a multinational energy company and one of the world’s leading integrated electricity and gas operators. We work in 37 countries across 5 continents, generating energy with a net installed capacity of almost 84 GW, selling gas and distributing electricity across a network spanning approximately 2.1 million km. With around 64 million end users around the world, we have the biggest customer base among our European competitors, and we are one of Europe’s leading energy companies by installed capacity and reported EBITDA. The Enel Group is made up of nearly 63,300 people from around the world whose brilliant work is based on our values of Responsibility, Innovation, Trust and Proactivity. Together we are working on the same goal. We are Open Power and our aim is to overcome some of the greatest challenges facing the world. This is to be achieved through a new approach which combines attention to sustainability with the best in innovation. Smart green corporate VC: With a workforce of around 20.000 employees, EnBW Energie Baden-Württemberg AG supplies electricity, gas, water and energy-related products and services to 5.5 million customers. Given our origins, and as a company which is majority owned by the Federal State of Baden-Württemberg and Oberschwäbische Elektrizitätswerke, a municipal special-purpose association, our connections to Baden-Württemberg are particularly strong. We want to be the first point of contact for our customers – households, industry and municipalities – in all matters affecting energy. We will achieve this aspiration on the basis of our experience and innovation strength, combined with listening and dialogue. Close to the customer we are creating new growth opportunities with new products and local solutions for a sustainable supply of energy and enhanced energy efficiency. We will forge ahead with the expansion of renewable energies, first and foremost wind and hydropower, while securing the supply of energy through our cutting-edge conventional power plants. Our grid subsidiaries are setting in place the preconditions for integrating an increasing volume of renewable energies and smart energy systems into the grid. Smart green corporate VC: Statkraft is a leading company in hydropower internationally and Europe’s largest generator of renewable energy. The Group produces hydropower, wind power, gas-fired power and district heating and is a global player in energy market operations. Statkraft has 3.600 employees in more than 20 countries. We are managing 1.000s of renewable energy assets with more than 10.000 MW capacity for our clients, integrating their production into the European power market. Statkraft wants to invest into startups in order to create growth options and to drive new capabilities. We are committed to play an active role in the energy market transformation, have an attractive portfolio for applying innovation and maintain a pioneering spirit. This makes us a great partner for startups on the frontier of the energy market‘s paradigm shift. We are aiming to invest in Europe, targeting €1-5M per deal in Series A and later. On our watch the world must change drastically. The UN’s Intergovernmental Panel on Climate Change has never been so clear: CO2 emissions must go down quickly. More production and use of renewable energy is an important part of the solution. TrønderEnergi is already a major player in water and wind power – now we will do even more in wind. TrønderEnergi strives to create value through environmentally friendly production and distribution of energy for the benefit of the local region. The Group generates annual sales of approximately NOK 1.5 billion and employs around 400 staff (about 150 without distribution). TrønderEnergi is organised as a group where TrønderEnergi AS is the parent company of a number of subsidiaries. The main focus of the Group is renewable energy production and energy relateded business. TrønderEnergi is owned by 24 municipalities in Trøndelag county, KLP (Kommunal Landspensjonskasse mutual insurance company) and Nordmøre Energiverk AS. Alpiq is a leading Swiss energy services provider and electricity producer in Europe. We have been generating climate-friendly and sustainable electricity from carbon-free Swiss hydropower for more than a hundred years. Our unique expertise in the field of flexibility marketing and cross-border trading, our staff work around the clock to secure the profits of our customers. Thanks to our Energy AI Platform, we optimise electricity generation and consumption as well as the energy flow between producers, prosumers and consumers in order to stabilise the electricity grids. Through our cleantech incubator Oyster Lab, we solve consumer problems and hope to make the world a greener place. NEW is a municipal utility company headquartered in Mönchengladbach on the Lower Rhine. NEW supplies around 400,000 customers with electricity, 157,000 with gas and 102,000 with water. Additionally, the approximately 2,000 employees of NEW are responsible for the public transport and the operation of baths in their region. At the interface between its business fields of energy supply and mobility, NEW is highly committed to expanding e-mobility. The product cosmos in the field of e-mobility includes the expansion of the charging infrastructure through charging stations, the sale of wall boxes for home-based charging as well as a favorable charging current tariff. Since this year, NEW also operates “Wheesy”, a public car sharing program for electric vehicles, and is involved in the development of SVEN, an electric car that is especially designed for car sharing. Thus, NEW provides a coherent overall concept for urban and flexible mobility – on the Lower Rhine, nationwide and internationally. Smart green VC: Investitionsbank Berlin (IBB) is the business development bank of Berlin. With a wide product spectrum it is active in the areas of business as well as housing and real estate promotion. IBB supports small and medium-sized enterprises in Berlin with subsidies, loan products and equity stakes developing targeted solutions for its clients. In doing so it works in close cooperation with all local commercial banks. IBB takes a central role in economic development by financing small and medium-sized enterprises. Its particular focus lies on innovative companies that are active in the following key sectors in Berlin: health economy, information and communication technology, media and creative industry, transport, mobility and logistics, energy technology and optical technology. A further focus is the support of founders and startups with targeted advice as well as a full range of funding products customised to the respective need of each client. Amsterdam-based PURE Executive Search recruits people who will take your company to the next level. Candidates with the right skills and mindset, that fit into the corporate culture and are a perfect addition to the team. Since 2007, Imke Lempers has been fully at home in the world of innovative companies, sustainable startups and multinationals in preparation of the big green change. Imke founded PURE Executive Search in 2011 to fast track the greening of the corporate world. To this end, she makes use of the network she carefully built during her career in human resources and executive search for the professional services industry. Among others, she worked at McKinsey & Company, Capita Selecta and the Global Management Program at ING Group. In her day-to-day work, Imke puts the knowledge she gained studying Psychology at the University of Amsterdam to good use. Smart green startup: Sunfire sees itself as a leading provider of Power-to-Fuel and Power-to-Gas technology. To this end, the company develops and produces the key components high-temperature electrolysis (SOEC) and high-temperature fuel cells (SOFC) and the corresponding fuel plant engineering. The Sunfire process uses intermittent renewable electricity, water and CO2 from various sources to produce high-quality, synthetic fuel and gas. These can power cars, trucks, aircraft, generators, and heat residential and commercial buildings, without changes to current engine technology or distribution infrastructure. The company employs a staff of 38 highly educated and experienced people, has a best-in-class test facility, an R&D fuel plant and a modern manufacturing hall in Dresden. Sunfire is backed by Electranova Capital, Total and Inven Capital. Smart green startup: As a software-as-a-service company, GreenCom Networks offers a white label Energy IoT Platform to utilities, energy service companies, and energy-relevant device manufacturers. With its platform GreenCom Networks enables customers to launch disruptive digital business models while leveraging the increasing share of distributed energy assets and end consumers’ demand for innovative services like energy flat rates, energy communities or peer-to-peer energy. Smart green startup: GreenPack mobile energy solutions is a young Berlin-based startup which is working on innovative solutions for the energy and mobility turnaround. GreenPack’s aim is to establish a mobile and sustainable energy network. The core is the green and powerful GreenPack battery. Thanks to a well-engineered battery changing system with practical sharing points, electromobile applications like e-cargobikes, e-scooters, horticultural machines and much more are able to work in a highly efficient, risk-free and cost-optimized manner. GreenPack pursues a comprehensive Battery-as-a-Service approach which also includes maintenance and other services. This makes the concept highly attractive for site and vehicle partners, too. With Dr. Christian Speidel as an investor and mentor and a team of currently 14 permanent and 4 freelance employees, GreenPack is working day by day with passion to provide mobile energy for everyone. Smart green startup: Enerkite is a global leader at developing portable airborne wind energy converters for off-grid power supplies and standalone chargers. With an extremely high potential for success we define a new market with the next generation renewables: flexible as diesel gensets and cheaper than coal. Our working prototype has proven the concept, demonstrated its usability and validated the scalability of a future product portfolio. One of the largest energy companies world wide has evaluated airborne wind energy and has choosen EnerKite as pilot partner with the following statement: „From a techno-economical comparative analysis, EnerKite was identified as one of the most promising technologies and best fitting our company’s mission and goals.” At EnerKíte, high-tech and craftsmanship goes hand in hand. Our interdisciplinary, skilled and enthusiastic team consists of about 20 pioneers and industry experts in wind energy, aerospace engineering and software development. After winning renowned grants at a total value of EUR 3.5 Mio. recently, our team is significantly expanding and is looking for strategic investors and partners towards industrial prototyping and the commercial proof of concept. Smart green VC: IP Group is a leading intellectual property commercialisation company which focuses on evolving great ideas, mainly from its partner universities, into world-changing businesses. The Group has pioneered a unique approach to developing these ideas and the resulting businesses by providing access to business building expertise, capital (through its 100%-owned FCA-authorised subsidiary IP Capital), networks, recruitment and business support. IP Group has a strong track record of success and its portfolio comprises holdings in approximately 100 early-stage to mature businesses across four main sectors – Biotech, Cleantech, Healthcare and Technology. The Company is listed on the Main Market of the London Stock Exchange under the code IPO. Smart green VC: Munich Venture Partners (MVP) is one of Europe`s leading Cleantech Venture Capital specialists located in Munich, Germany. Founded in 2005 and cooperating in a long tradition as preferred partner with Fraunhofer Gesellschaft (Europe’s largest application-oriented research organization), MVP focusses on growth investments in the technology sectors sustainable environmental and energy technologies, green ICT, energy efficiency, agriculture and food, mobility, and sustainable materials. The investment portfolio spans all over Europe, including selected international businesses. MVP is a partner in the Competitiveness and Innovation Framework Programme led by the European Commission. Munich Venture Partners is convinced that the combination of exceptional entrepreneurs with innovative technologies is the key to a bright future of our society. Smart green accelerator: Rockstart Smart Energy Accelerator is a 150-days intensive startup accelerator program designed to help early stage smart energy companies go to market faster. These 9 startups joined the 2017 Program and are receiving all the support they need to realize their ambitions and make new ideas come to life in the complex energy industry. The program offers support from over 75 experienced mentors, opens up new networks and connects the startups to investors. The startups originate from 10 different countries and are developing new, sustainable ways to generate, share, and utilize energy. The Rockstart Smart Energy Demo Day takes place on 14 September 2017. Hyperion Executive Search is a specialist headhunter within the clean energy, energy storage, e-mobility and cleantech markets. Our focus is across EMEA and North America. We help our clients achieve their strategic growth and revenue goals by enabling them to attract, attain and retain the key talent they need. In particular we work with post-investment startups and fast growth companies, to recruit high impact leaders, management teams, and sales tigers. We also build full teams, and help our clients set up new territories or product/service lines. Alexa Capital delivers leading capital solutions across the energy, energy infrastructure and technology sectors. Our professionals have unique energy market sector insights built up over three decades of working across Europe, North America and Asia in energy, technology & communications investment banking, fund management and private equity. We can leverage global relationships across the corporate landscape, the investment community and government policymakers.